Very simply, E-Commerce is the marketing and distribution of goods over the Internet. Whether you are a "brick and mortar" business looking towards the future, or a recent or potential start-up, WebTech Masters can advise and develop your online enterprise from beginning to end. We can help you create a whole new information system, integrate an existing system or streamline an online venture already in place. Our consultants are familiar with the latest and best technologies with expertise in traditional paper and electronic legacy systems. E-store. 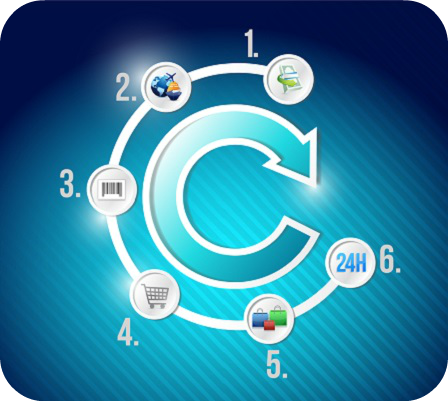 Probably the most popular and familiar e-commerce application is the E-Store. An E-store is exactly what it sounds like, the electronic counterpart of the typical retail establishment. Through your custom-built web site, customers can browse through items, check prices, even push a virtual "shopping cart" around the store, filling it up as they go and "check out" when they want. But E-Stores offer even more benefits than traditional customer service. First of all, these dynamic web sites are open 24 hours a day, seven days a week, around the world. Moreover, the customer can personalize the site according to their particular needs and desires. This feature can even occur "unconsciously" for the customer: by tracking where on your site they browse and purchase, your e-store can create custom "displays" according to their habits. Imagine, your e-store automatically generates a personalized marketing strategy for each and every person who uses the site. E-Distribution . The E-Store technology can be integrated seamlessly with an electronic distribution system, whether that is handled in-house, contracted out, or addressed on a per-purchase basis. Thus WebTech masters E-Commerce solution provides the "end-to-end" process for the sale of goods and services by retailers, manufacturers, wholesalers and distributors. With our custom-developed e-commerce solution, you can create powerful, mutually beneficial relationships with customers, distributors and suppliers to increase sales, reduce processing time, and improve margins, getting a step up on the competition. WebTech Masters can even host and maintain your e-commerce site, reducing hardware, labor and training considerations. In order to excel in the current e-business environment, you need to share information with your customers, prospects, employees, and suppliers across time zones and large geographic expanses. WebTech Masters E-messaging is the communication platform that can link, extend and enable the people and activities essential to your business. Hosted E-mail Services- provides a flexible, scaleable and cost-effective solution for e-mail service. It includes the design of a robust, high-availability messaging system that is scalable to meet your needs today and in the future. You also get your choice of e-mail, scheduled upgrades and technical support, and Softech provides the server hardware, systems design and operational support. Mail Integration Services. provides the solution to a commonplace challenge--enabling communication among disparate mail systems. We can integrate and/or consolidate your different messaging systems, linking your business units and extending your company globally. The services also include an assessment of corporate support and operations models to minimize support staff for the new messaging infrastructure. System Enhancement Services provides tools and services that extend and protect the investment made in a messaging infrastructure. We introduce best-in-class tools that manage messaging addresses, streamline system administration, improve mail delivery, provide system virus protection, and block unauthorized access and inappropriate use. Assessement, planning, design and implementation of messaging infrastructures. Enterprise and Consumer Class messaging services. Integration and/or consolidation of multiple messaging systems, products, and platforms into a single service. Operational excellence through best-in-class system administration processes. Directory services that enable management of messaging addresses and "business card" addressing. Custom Directory Management Agent to ease administration of an Exchange environment. Anti-spam, anti-virus, and content validation tools to protect your messaging system. Mail relaying services that improve mail delivery. Business Continuity Consulting Services -- Offers business resumption planning for critical business functions and processes. Information Assurance Solutions -- Provides secure access to the Internet or your intranet, while managing risk and maintaining performance as you prepare for a future in e-commerce. WebTech Masters can provide consulting at any stage in your IT development, whether it’s in the discovery stages of a brand-new venture or streamlining an existing system. We can help you create new business models and roadmaps for achieving a competitive advantage in the digital economy and advice on the development of new information architectures. At WebTech Masters, we make your career goals our goals. Our aim is to provide you with employment opportunities that are challenging, stimulating, and financially rewarding. If you are a skilled, highly motivated IT Professional we encourage you work with us and we help you achieve what you want to. We are the preferred vendors for multiple large and small organizations. We also sponsor green cards and H1 visa. We also have senior consultants who can help you train and then we will place you. So Join hands with WebTech Masters today to find a job of your dream. Candidates looking for employment opportunities should fill our future employment form (hyperlink this and attach to form).